I love Google Docs, but at the end of the day, when I want to do some serious work, I use Microsoft Word 2010. While Google Docs has really, really been stepping up its game lately, I just feel at home in Microsoft Office. And now that you can save your Microsoft Office 2010 files directly to your SkyDrive and edit them online via Microsoft Office Live, it makes even more sense to rely on Microsoft Word. But now, Google Mobile has upped the ante by offering mobile editing in Google Docs. Very, very groovy—that feature has been a long time coming, and I love it, even though it’s fairly rudimentary for the time being. 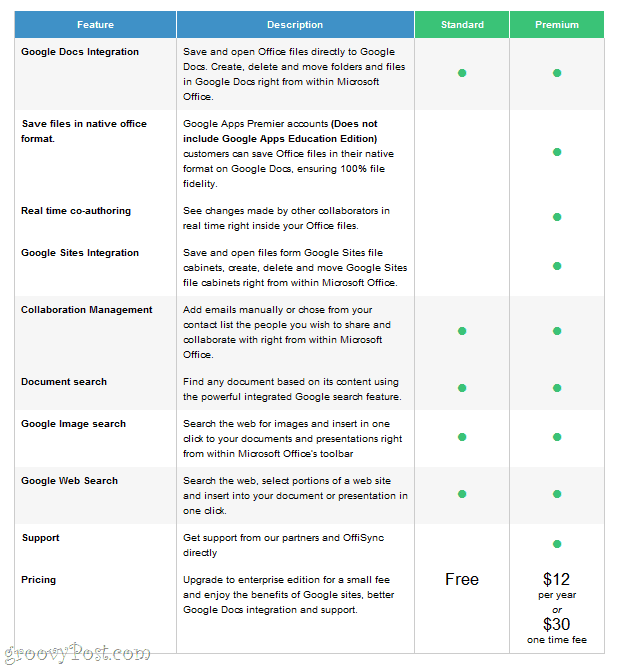 Combine all of that with OffiSync—a free Microsoft Office Add-In that lets you open and save files directly to Google Docs—and you’ve got a real winning combination. 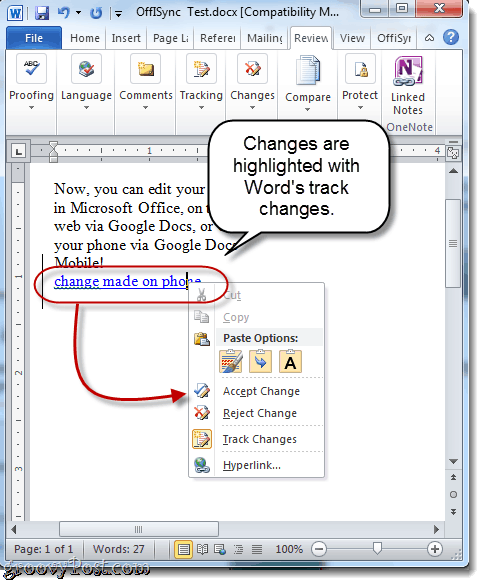 Use Microsoft Word when you’re at home or work. Use Google Docs if you’re on a public computer or on a friend’s computer. Use Google Docs mobile on your iPhone or Android phone when you’re on the bus, waiting in line or stranded on a broken ski lift. I say best of both worlds a lot, but this time I mean it. It even works for Google Apps accounts. Download the free version of OffiSync and run the installer. Launch Microsoft Word and click the OffiSync tab. When you try to do anything with OffiSync for the first time, you’ll be asked to add a Google account. 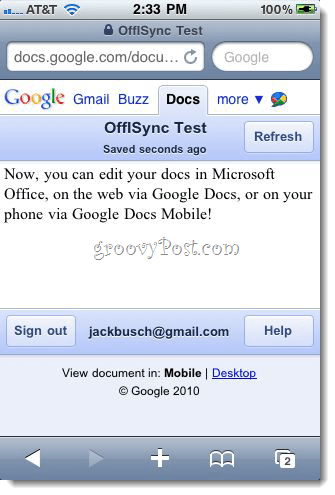 Use your Gmail address and normal password to connect OffiSync to Google Docs (and Google Sites). You can add additional accounts later by clicking Settings and choosing Accounts. 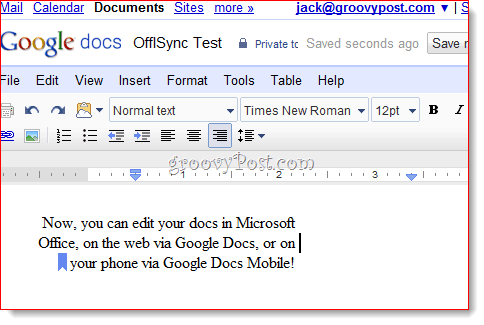 Now, you can open items in your Google Docs account and save them to Google Docs, all from within Microsoft Office. Simply use the Open and Save buttons on the OffiSync ribbon whenever you want to access your Google Docs. When you do so, you’ll see a separate dialog box from the usual Open or Save as… window that automatically loads your folder structure on Google Docs. As you’ll see, your docs will also be sorted according to which Google Docs account it’s in. And that’s all there is to it. As you can see from the screenshot below, I have access to my docs from the web, from my desktop and from my phone. 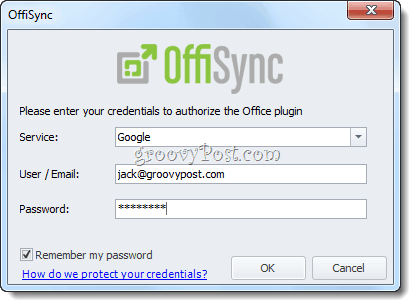 The OffiSync Add-In also comes with a nifty dashboard, which gives you information regarding Google Docs permissions and recent documents. Now, you may ask, “What happens if someone is editing the doc when I have it open?” No worries—OffiSync notifies you of the changes with a little popup notification near your system tray. You can choose to merge the changes or merge the changes and review them. If you choose to review the changes, they’ll be highlighted using track changes. All of this can be done using the free version of OffiSync. The Premium Version, which costs $12 per year or $30 for a lifetime license, gives you additional features, such as the ability to save files in their native Office format (Note:You must have a paid Google Apps Premier account for this to work. Thanks to reader johnl for pointing this out. ), real time co-authoring, Google Sites integration and premium tech support. 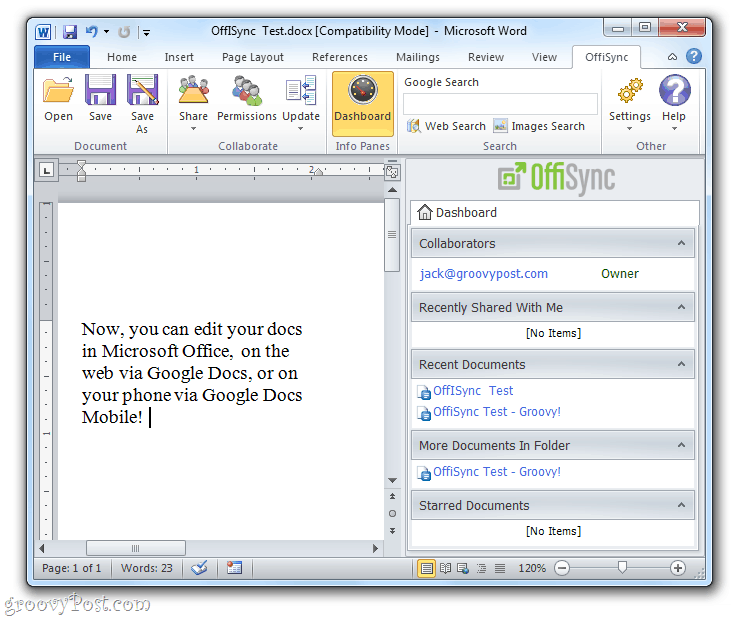 Depending on how collaborative you are with your Office docs, premium may be worth it, but if you just want to be able to edit your docs using the best tools for the web, on your desktop and on your mobile phone, then OffiSync’s free version fits the bill. Something you didn’t point out and OffiSync does on its site is that you CANNOT save files in their native format purely by paying for the Premier service. For it to work you must have a Google Apps Premier Account first at $50 a year and that does not include the Education or Free Version. I found this out when I did exactly as you state in your document and could not get it to work. I would give OffiSync 10/10 for customer support and service though as they immediately refunded my money without even being asked and responded to all of my questions very quickly. The only negative I found to OffiSync was that every time I opened a document in Word I got a pop up request to save the document. I couldn’t find anyway to turn that off so I got rid of the whole thing. Other than that it is a great program. Thanks for bringing that to our attention johnl, and sorry for not including it in the article. Glad you enjoying OffiSync otherwise–and thanks for the report on their customer support! This was one of the first add-in we purchased when we moved over to Google Apps. We had set up a fairly complex folder structure in Apps (a lot of nested folders) and in the beginning this folder structure, for some of my team, was not being mirrored by OffiSync – nested folders appearing at the root. After a week or so of using OffiSync, it sorted itself out. I did receive a tip in the Google Apps Marketplace that creating the folders in OffiSync would help eliminate this issue. 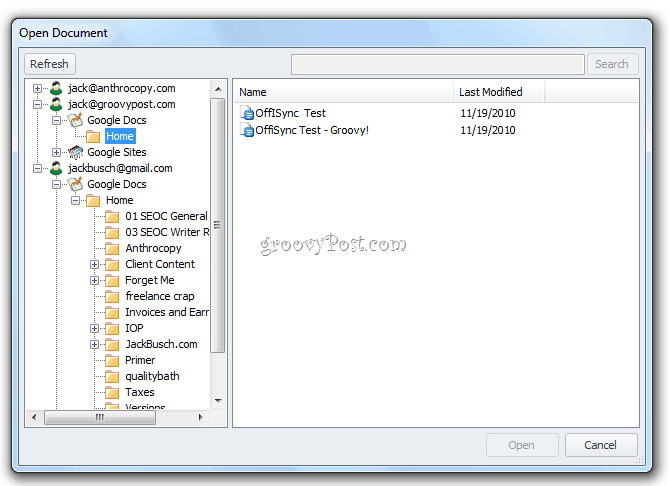 Offisync is broken as of October 4, 2011. I understand it’s a free add on and it generally works great. We have not been able to access Offisync since September 26th. The odd thing is that I have had no response from the Offisync folks, I have contacted them several times. Same for us I’m afraid. And I just renewed 9 annual licences for my team. Going to send them another mail now. See that Offisync was acquired by Jive Software. I have sent a mail to them too. Will post back if I get a response. Response back from OffiSync was that “Due to a change in Google’s API, some OffiSync users experienced issues”. Advice was to check for updates under settings to download latest version which addressed these issues. It now works for the rest of my team, but not me, which I believe is due to 2-step verification I am using for my Apps Account, the rest of my team are not using this. Hope Bill it now works for you too.